and a rock painting depicting a well-known creator being from Arnhem land, Yingarna. The likeness between these two images is immediately striking; we recognise similar posture with the same positioning of the legs and breasts, cartoonish exaggeration of the female genitalia, and clearly inhuman heads”. I (Damien Mackey) would neither accept his dating (his evolutionary views), or his belief that the aboriginals were at Göbekli Tepe only after having been in Australia. Göbekli Tepe first, I would suggest, and then, some time later, the great southern continent. Scientists and independent researchers have publicly speculated on the purpose of the mysterious Göbekli Tepe megalithic complex in southern Turkey. The question that the experts seem unable to address is the identity of the builders. 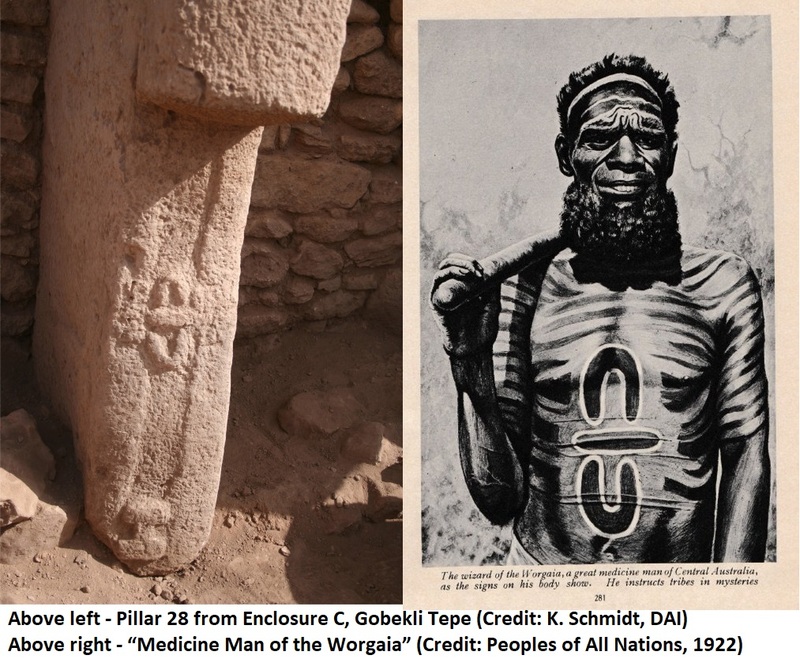 Having completed an in-depth investigation of human origins and early migrations, it is now appropriate to reveal my extraordinary findings – Göbekli Tepe is the product of Aboriginal Australian culture. The identification of the builders will likely be considered very controversial, as it should because this represents a major paradigm shift. Göbekli Tepe is the largest well-dated megalithic complex of the pre-pottery period. There may be other megalithic sites of greater antiquity, but none matches the complexity, scale and advanced knowledge revealed at this site. In 1994, Klaus Schmidt of the German Archaeological Institute began excavations at a Neolithic hill site in what is today southern Turkey (formerly Armenia). Beneath the hill was the most extraordinary archaeological site yet uncovered, remarkable for both its immense size and incredible antiquity. Göbekli Tepe is an arrangement of at least two hundred T-shaped stone pillars of up to 6 metres in height and 22 tonnes in weight. The pillars are covered with imagery. The recognised boundaries of the complex include over 22 acres of land.1 The physical aspects of the Göbekli Tepe archaeological site are quite amazing, but its dating astonished researchers. The pillars of Göbekli Tepe have stood for at least 12,000 years, 10,000 of those underneath a huge pile of soil deliberately placed over them. Certainly, the megalithic builders responsible for Göbekli Tepe lived through the collapse of their civilisation and decided to bury their work. It is evident their culture went into rapid retreat, and today it only remains in the region of origination [sic] – Australasia. The stones of Göbekli Tepe speak, but only if one knows their language. These mighty megaliths bear the signature of the Australian Aboriginal traditions from which they emerged. The fingerprints of this culture remain across much of northern Australia, but lest anyone raise the accusation of regional cherry-picking, the focus here will be almost entirely in one area, Arnhem Land. Yingarna is a female, humanoid, personification of a rainbow serpent, one of the powerful entities from Aboriginal mythology (Dreaming Lore). If we look again at the engraving of the female figure from Göbekli Tepe, we see it has one of Yingarna’s yam leaves as her head. This parallel in iconography, across such a vast distance, is nothing short of stunning. (image credit: Ben Gunn). If we take a closer look at one of the serpents depicted at Göbekli Tepe, on a stone artefact (see page 63), we see the exaggerated head. It is evident the artists tried to make it clear these are not common snakes. The yam-leaf-shaped heads remind us immediately of rainbow serpent iconography. If we take a glance at the painting of Yingarna with her bags we recognise the same bulbous head with prominent eyes. If we were to add two arms to this snake engraving, and placed a few bags around the neck, we would have a perfect replication of Yingarna. The builders of Göbekli Tepe were living during a time of global catastrophe, a significant part of which involved flooding, animal extinctions and assumedly forced relocations. With immense changes happening in their world, it may be that Göbekli Tepe represents their strenuous human effort to reverse the declining environmental situation. The images at Göbekli Tepe are mostly animals; it is tempting to think that this represented a significant effort by the shamans to call forth the spirits of the animals, many of which had become extinct. The second part of this project would have been an effort to placate spiritual beings associated with flooding, such as the rainbow serpent. Snake images are everywhere at Göbekli Tepe. Birds are another well-represented animal form at Göbekli Tepe. At the very bottom of pillar 43 we see a large bird head attached to a very long neck, we do not see the body, but it looks rather like an emu. Large flightless birds appear elsewhere, most notably on pillar 56 where we see representations of multiple large-bodied birds with long necks. These bird images are almost identical to emus represented in rock art from Arnhem Land. These large birds may, in fact, be Genyornis, an emu-like bird that went extinct around 30,000 years ago. Similarities are evident when we look at a rock art depiction of Genyornis from a site in Australia’s Northern Territory. The emu holds a very special place in Aboriginal astronomy, associated with the dark rift of the Milky Way.